Essentially I have two arguments against Darwinian convergent evolution. 1. Darwinian evolution has no scientific basis for convergent evolution. 2. Empirical and real life observation refutes Darwinism as a possible explanation for analogous traits in diverse organisms. Darwinists claim that convergence of functional, morphological and structural traits from phyletically unrelated species are a result of random mutation directed by similar environment and selection pressures. This would mean that environmental and selection pressure is a greater driving force for how a species is to evolve than random mutation. From a Darwinian point of view the diversity of life is achieved by random mutation of an organism’s genetic material. Random mutation is a blind and unguided process, how is it able to arrive at the same solution so often in the history of life? The answer according to the Darwinists is that environmental and selection pressure trumps random mutation. We can test this hypothesis by using an example of convergent evolution of the marsupial Tasmanian wolf (thylacine) from Australia and the placental Grey wolf from North America. Let’s step back and see how convergent evolution begins. About 160 mya the supercontinent Gondwana started breaking apart. Africa, then New Zealand and finally Australia at about 55 mya started drifting off. The current scientific understanding is that marsupial and placental mammal diverged between 225 – 125 mya, because the oldest mammalian fossil was found in Texas dating to 225 mya and the oldest placental (Eomaia scansoria) was dated to 125 mya. Now when the continents begin to break apart, the thylacine and Grey wolf did not exist yet. In time through Darwinian evolution and speciation the thylacine and Grey wolf emerged. Despite the obvious unrelated recent ancestral lineage these two animals evolved strikingly morphological similarities. The Darwinian answer comes in two forms. 1. These are just superficial similarities = superficial convergence. The important distinction between these two animals is their dentition, which has no convergence. 2. Animals living in similar environments will develop similar traits as predicted by convergent evolution. The Darwinists are clutching at straws with these 2 arguments. Here is why. Consider the first argument to explain away the convergence by NCSE. NCSE goes through great pains to convince the reader that in a detail analysis of how the teeth of the thylacine works are very differently than that of the Grey wolf. This is blatant equivocation on their part, because they choose to focus on that narrow aspect of the dentition. What NCSE neglected to tell you is that why do biologists know how to distinguish between marsupial and placental mammals. Denton points out that if you had never known about the geographical isolation between these two Subclasses of mammals, we would consider them to share a recent common ancestor. Take a look at these picture and you can judge for yourself if the similarities are as superficial as NCSE is trying to imply. 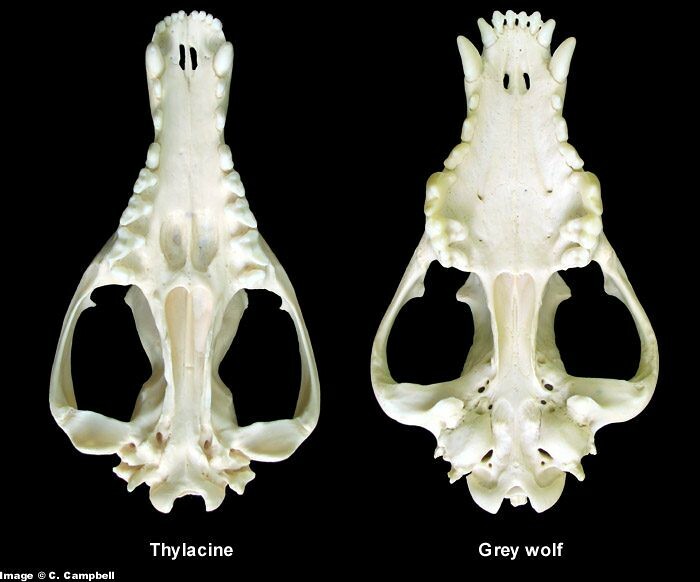 Shown above are side-by-side images which demonstrate the morphological similarities between the skulls of the thylacine (Thylacinus cynocephalus) and Grey wolf (Canis lupus). 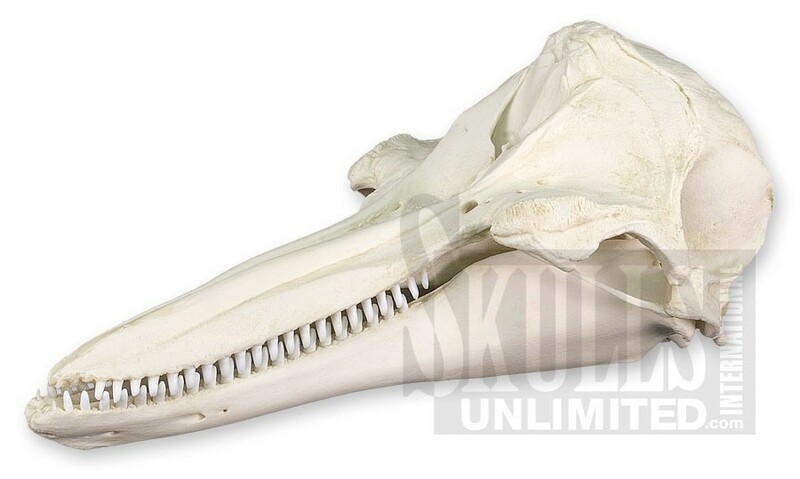 Contrast them with 2 other marsupial and placental skulls, a red kangaroo and a bottle nose dolphin respectively. The Darwinists would like to distract and mislead you to focus on the minute differences between the thylacine and grey wolf, but the giant black hole in the room is why are they so overwhelmingly similar? And again Denton is right it takes a trained zoologist to tell these are not recently related species. The Darwinist might object that it is not fair for me to compare a kangaroo to a dolphin. But, why not? After a 100myr of separation from its common ancestor, logic would dictate that a random and unguided evolution should produce very different morphologies. It is not reasonable to think that Darwinian evolution would produce such phenotypical similarities. 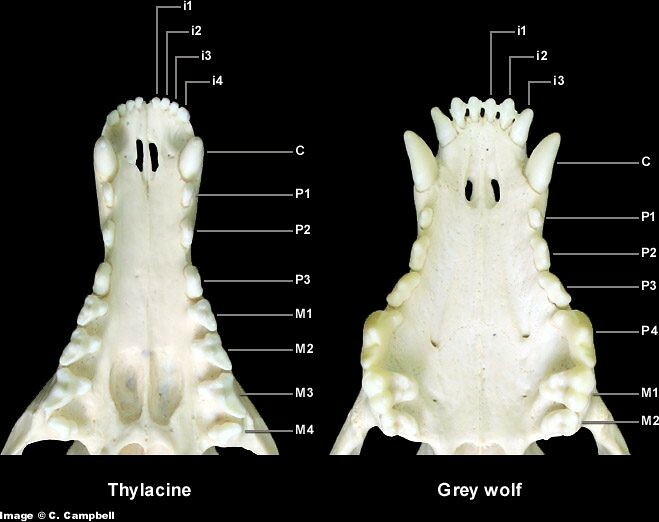 This comparison illustrate the differences in dental anatomy between the thylacine and its often-cited placental analogue, the wolf. Darwinists wants to explain away this remarkable convergence by focusing on the dentition of these two animals. Emphasizing on different number of incisors appearing only in the upper jaw, the shearing tooth in the wolf and other members of the placental Carnivora mammal, the thylacine lacks large grinding surfaces on its molars. The wolf has a total of 42 teeth, and the thylacine 46. Again look at the red kangaroo teeth. Why doesn’t the thylacine dentition look more like the red kangaroo? The Darwinists like a grifter wants you to believe these covergence is no big deal because the molars and incisors are slightly different in size and shape. No. It is the similarities stupid. Why isn’t the thylacine more like the kangaroo or something entirely different? The real question is why did these two phyletically dissimilar species evolve such similar features in the first place? The amazing part and the part that Darwinism has to justify is how similar they are not how dissimilar one particular feature is. Remember, neither the Grey wolf nor the thylacine existed in their current form. There are myriads if not infinite number of evolutionary pathways for the alleged ancestors of the wolf and thylacine from their 125 Ma branching point. How was this convergence possible? 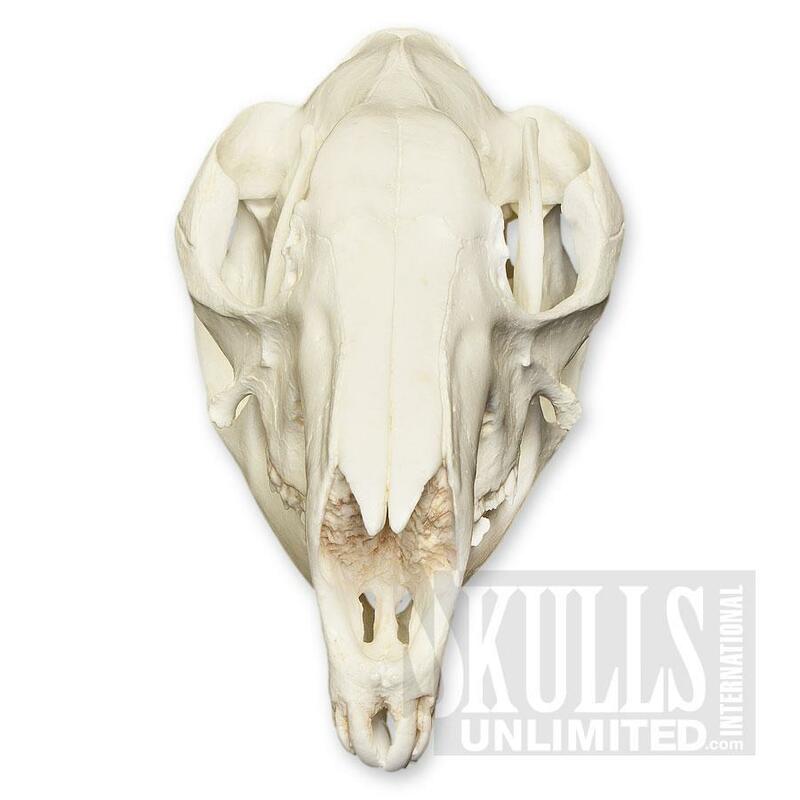 Consider the two side by side skull comparison while there is size variation of certain features; the 2 skulls are remarkably similar. Also compare the phenotypic adaptations; their similarities are the reason why they are both labeled as wolves. Again the problem for Darwinian evolution is why are they so similar, given the limitless phenotypical variations that these 2 species can have? There are many unique animals in Australia, what reasonable Darwinian mechanisms can there be for an unguided process to randomly arrive at the same set of values? There is another aspect to the superficial argument and that is the phenotypic similarities are not real convergence. These similarities have no genetic significance. The problem with this argument is that it is much too ad hoc. 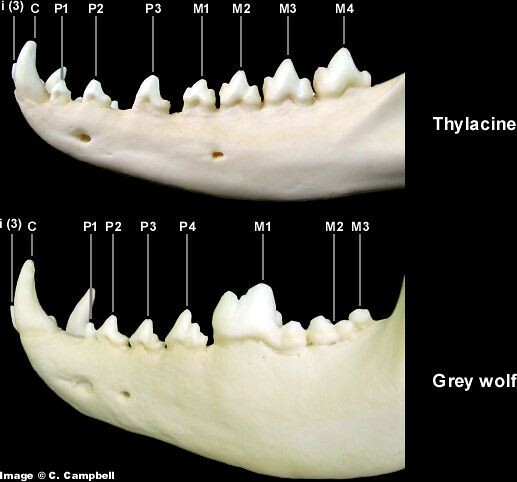 In the case of the thylacine wolf and Grey Wolf, is the dental function the only thing that is significant and all other similarities superficial? Can that same standard of distinction apply to all other classification of species even in alleged divergent species? What we have here is an implication of a Darwinian double standard. Darwinism has no problem classifying different organisms through morphological similarities. Unless they are convergent similarities then it becomes superficial. 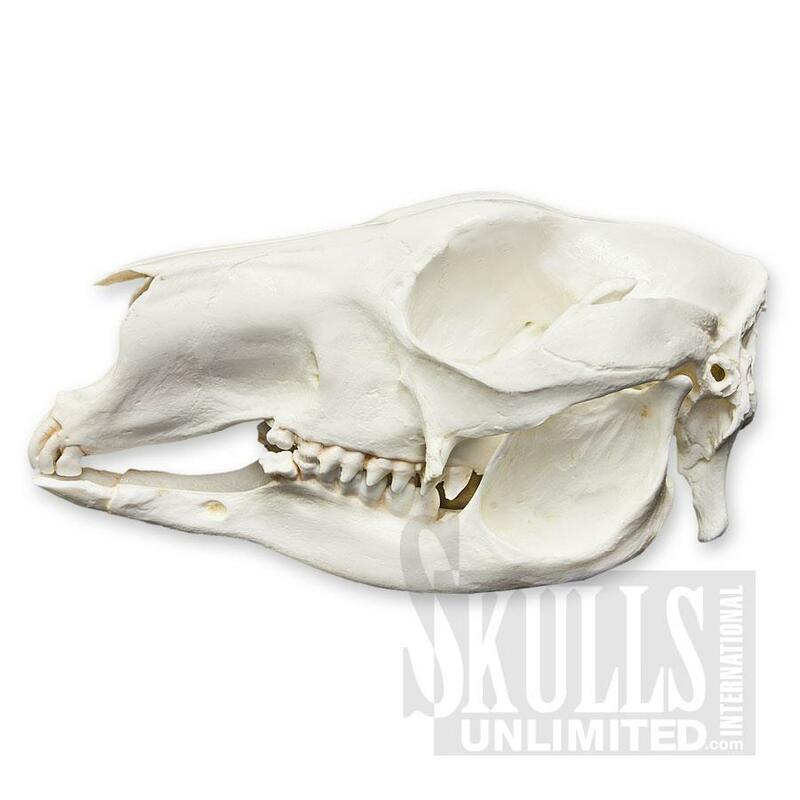 The ancestors of marsupials and placentals are thought to be not much more than a squirrel like animal over 165ma. After these two clades diverged the marsupials evolved into many different forms. I think for Darwinists to say that after 100myr these two groups by a totally random and unguided process to evolve a set of genes that would create this extreme amount of similarities is just not rational and stretches beyond credulity. Darwinists like NCSE can say until their face turn blue that these convergences are trivial but it still will not make it rational. Beside if they are so trivial then why aren’t all animals subsequent to the divergence have these convergent features? In other words, where don’t all placental and marsupial animals look the same? 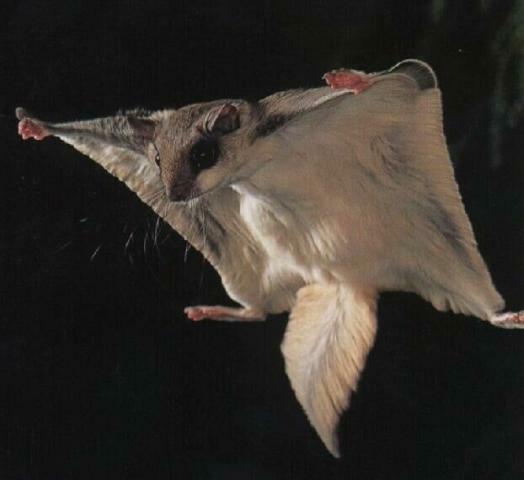 These are not the only analogous pair either, there are also flying squirrels and flying phalangers, mouse and marsupial mouse, mole and marsupial mole. Besides these placental and marsupial convergences there are whale and bats, plant convergence, anolis lizards, ranid frogs just to name a few. For the remainder of this article I will point out a few more types of convergence that makes no sense in a Darwinian framework but it makes perfect sense and it is predicted from a design perspective. The second argument by Darwinists to explain this convergence is that similar environments will develop similar traits, like the ecomorphs of the anolis lizards. Again, keep in mind that the wolf allegedly descended from a placental ancestor and the thylacine allegedly descended from a marsupial ancestor. The question then becomes during the evolution of these allege ancestors, were there any divergent species? Were the environments that produced the convergence of these two species similar for over 125 million years since their last common ancestor? Finally, the Grey wolf lives in a diverse range of environments from the continental US to Alaska. 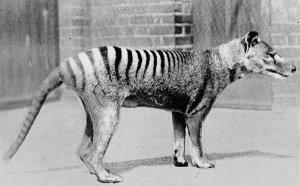 The thylacine lived mainly in dry eucalypt forest, wetlands and grasslands. If similar environments (E1 and E2) were the cause of convergence, why would there be divergence at all. If you have divergence then why would there be convergence. It is a catch-22 problem. If similar environment can cause the convergence of a thylacine and a Grey wolf, logic would demand that creatures living in the same environment such as those of species M in E1 or species P in E2 respectively would have the exact same morphology. This is what you should expect if the Darwinian explanation is correct. Even if it is possible to assume under very specific niches closely related species can develop similar traits. 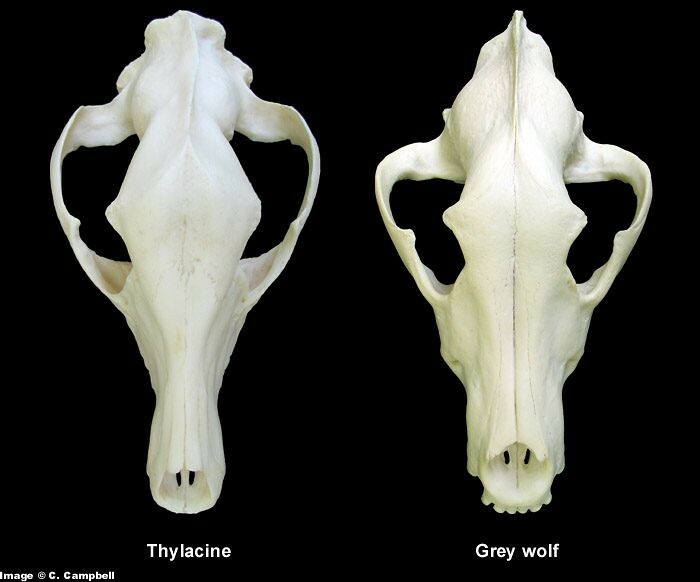 It is not reasonable to assume convergence for species like the Grey wolf and thylacine. The environment that the Grey wolf allegedly evolved in (North America to Alaska) and the thylacine allegedly evolved in (Tasmania Australia) can hardly be classified as an ecological niche. Darwinism would see this result and conclude that because 2 sets of the dice rolls from T1 and T2 resulted with the same set of numbers, then it must be the Craps tables that caused these dice rolls to converge. The reasonable explanation for the prevalence of convergence of life on earth is that it is a product of an intelligent design. This is not a conclusion because we lack the understanding of how life and Darwinian mechanisms behave. It is because we understand Darwinian random mutation and selection cannot produce the convergence that we see in the convergence and divergence of life. It is a catch-22 for the Darwinian mechanism. It needs genetic variation to explain the diversity of life and yet they need to limit the genetic variation to explain convergence. Even if similar environment does cause convergence, similar environment does not limit genetic variations. If it does have that much limiting effect there would be no divergence in the two respective environments. Bottom-line Darwinian evolution has no scientific basis for convergent evolution. Empirical and real life observations refute Darwinism as a possible explanation. The convergence between the thylacine and Grey wolf is not an isolated case. Convergence is pervasive in nature. While Darwinian evolution has historically focused on variation or divergent of species, convergence occurs much more than Darwinian mechanism can account for. Convergent features common to the sandlance and chameleon. Camouflage: cryptic eye and body coloration. Rapid, accurate strikes at small, mobile prey. Independent switching pattern of eye movements. Monocular range-finding (accommodative cues shown in the chameleon, inferred in the sandlance). Deep convexiclivate fovea in the retina. * — Features not known in other fish or lizards. Eyes often take a central role in discussions of evolution, with debate focused on how often such complex organs might have evolved. One such debate is whether arthropod compound eyes are the product of single or multiple origins. Here we use molecular phylogeny to address this long-standing debate and find results favoring the multiple-origins hypothesis. Our analyses of DNA sequences encoding rRNA unequivocally indicate that myodocopids-the only Ostracoda (Crustacea) with compound eyes-are nested phylogenetically within several groups that lack compound eyes. With our well-supported phylogeny, standard maximum likelihood (ML) character reconstruction methods significantly reconstruct ancestral ostracods as lacking compound eyes. We also introduce a likelihood sensitivity analysis, and show that the single-origin hypothesis is not significantly favored unless we assume a highly asymmetric model of evolution (one favoring eye loss more than 30:1 over gain). These results illustrate exactly why arthropod compound eye evolution has remained controversial, because one of two seemingly very unlikely evolutionary histories must be true.Either compound eyes with detailed similarities evolved multiple times in different arthropod groups or compound eyes have been lost in a seemingly inordinate number of arthropod lineages. According to Stephen J. Gould the famed evolutionist, you can never “replay the tape of life” and get the same result even with the slightest change. In support of Gould’s hypothesis, here is a paper published in Nature 420, 810 – 812 (19 December 2002) ”Macroevolution simulated with autonomously replicating computer programs”. The conclusion of this paper is that “Thus, even in this simplest of situations, the outcome of evolution can be any of several genotypes, and it cannot be predicted which will emerge in any particular realization.”. In other word convergence is not the natural outcome of Darwinian evolution. The cardiovascular risk factor LPA has a puzzling distribution among mammals, its presence being limited to a subset of primates and a member of the insectivore lineage, the hedgehog. To explore the evolutionary history of LPA, we performed extensive genomic sequence comparisons of multiple species with and without an LPA gene product, such as human, baboon, hedgehog, lemur, and mouse. This analysis indicated that LPA arose independently in a subset of primates, including baboon and human, and an insectivore, the hedgehog, and was not simply lost by species lacking it. The similar structural domains shared by the hedgehog and primate LPA indicate that they were formed by a unique molecular mechanism involving the convergent evolution of paralogous genes in these distant species. Read my comments on the convergence of this protein in my blog. Uniquely, the asynchronous flight muscle myofibrils of many insects contain arthrin, a stable 1:1 conjugate between actin and ubiquitin. The function of arthrin is still unknown. Here we survey for the presence of arthrin in 63 species of insect across nine orders using Western blotting. Analysis of the evolutionary distribution shows that arthrin has evolved a limited number of times but at least once in the Diptera and once in the Hemiptera. However, the presence of arthrin does not correlate with any observed common features of flight mechanism, natural history, or morphology. We also identify the site of the isopeptide bond in arthrin from Drosophila melanogaster (Diptera) and Lethocerus griseus (Hemiptera) using mass spectrometry. In both species, the isopeptide bond is formed between lysine 118 of the actin and the C-terminal glycine 76 of ubiquitin. Thus, not only the ubiquitination of actin but also the site of the isopeptide bond has evolved convergently in Diptera and Hemiptera. In terms of the actin monomer, lysine 118 is near neither the binding sites of the major actin-binding proteins, myosin, tropomyosin, or the troponins, nor the actin polymerization sites. However, molecular modeling supports the idea that ubiquitin bound to an actin in one F-actin strand might be able to interact with tropomyosin bound to the actin monomers of the other strand and thereby interfere with thin filament regulation.